For those coming from cold countries, the lack of a central heating system in Japan might be surprising, but there is no need to worry as there are many Japanese tricks for keeping warm. If this is your first winter in Japan, you would have no doubt realized that it can get as cold inside as it is outside. So, whether you are chilled to the bone in snowy Hokkaido or simply shuddering from icy winds in Kanto, here are the top 5 ways to find some of that elusive heat. Most built in air conditioner units in Japan include a heater (暖房 (だんぼう)) mode that blows hot air at the temperature you set. Many also include a timer function which is great for warming up the room for when you wake up in the morning. When using the 暖房だんぼう・Heater, it is crucial for you to familiarize yourself with the Kanji on the remote-controller. 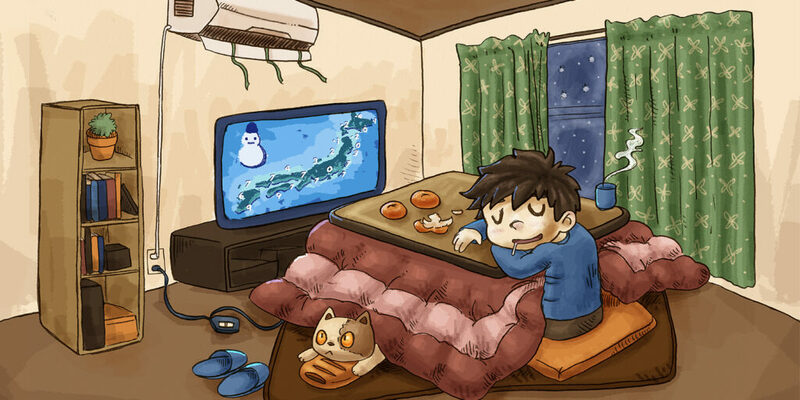 Besides electronics and sushi, the Kotatsu (炬燵 (こたつ)) ranks as one of Japan’s greatest winter inventions. It consists of a low table with a built-in electronic heater underneath. The top of the kotatsu consists of two tables with a futon (布団 (ふとん)) sandwiched between the two. Traditionally, the family (家族 (かぞく)) would sit around the Kotatsu and enjoy family time (一家団欒 (いっかだんらん)) by drinking tea (お茶 (おちゃ)) or watching TV. Once ensconced into the depths of a 炬燵こたつ・Kotatsu you will find yourself 温まるあたたまる・Warmed to the point where it will be hard to ever leave the kotatsu again! ホットマットHot Mats are a type of heated electronic carpet. They don’t get especially hot but rather provide a nice warm barrier between your feet and the cold floor. These mats come in handy as it is common in Japan to sit on the floor. And since the mats do not become very hot at night you can put your futon on top without worrying about it burning your futon. カイロKairo are the perfect size to take with you outside during the cold 冬ふゆ・Winter months. They consist of a small bag that you simply shake and the chemical powder inside will emit a steady, constant heat that is good for a few hours. カイロ can be purchased at most convenience stores and are usually priced at under ¥100. If you spent a lot time outside stuff a couple カイロ in your pockets to keep nice and toasty. Certainly not unique to Japan, unless you count the countless kawaii covers that many households use to decorate their 湯たんぽゆたんぽ・Hot Water Bottle, the hot water bottle is perfect for sharing your futon with on a cold winters night. As expected, its basic form is pretty much exactly the same as in your own country, but Japanese people excel in decoration and this humble heater is no exception. Buy it, but then go and shop for one of the many cute, stylish covers to make it complete.